Today I'm typing my post from the local library because our internet service is out due to weather. We called the local cable company and they told us we were on the schedule for the 15th. Needless to say we told them we both needed the internet for our businesses and they would have to reschedule that for an earlier time. They are going to try. Ha! We are one of only eleven people in town without service. Just my luck! I realize that people are without heat, food, a home....so my problem is minor in comparison. Forgive my complaining. Anyway, I had so much to post that I made a little trip so that I could get this out to you. I can't put a link on this one because it doesn't start until tonight. You can always click on the link in the righthand column for my eBay store. A little gingerbread cottage and two snow laden evergreen trees are tucked into creamy white frosting on a delicious gingerbread cupcake. A red and white checked ribbon is wrapped around the edges of the canvas and tied in a bow at the top. The background for this little painting is an antiqued recipe from an old cookbook that I decoupaged onto the front of the canvas. Three little sparkly gumdrops are placed in the cream cheese frosting on top. 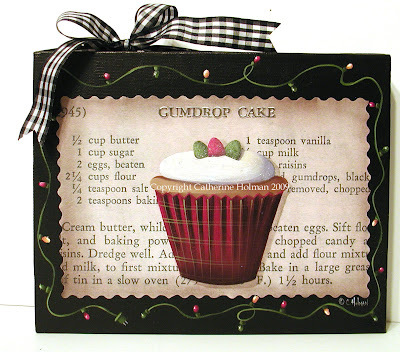 The cupcake liner is red and green plaid and colorful Christmas lights wind around the border. Touches of glitter are applied to the gumdrops and the frosting and may not show up in this photo. A black and white checked grosgrain ribbon is wrapped around the edges of the canvas and tied in a bow at the top. 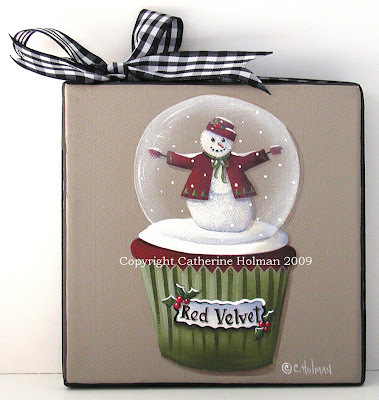 A cute little snowman, Crystal, is decked out in her red velvet jacket. She is perched on top of a red velvet cupcake inside a beautiful snowglobe. A black and white checked grosgrain ribbon is wrapped around the edges of the canvas and tied in a bow at the top. Now.....for my giveaway. This is for all of you cupcake lovers out there. 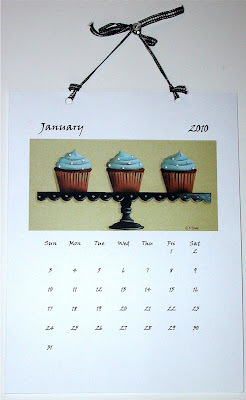 I'm giving away a 2010 Cupcake Calendar and.....a print of my Eggnog Cupcake. This is a print not a painting. The original is already sold. Just leave a comment on this post to enter. For a second entry, post about my giveaway on your blog and return to this post to let me know. Make sure your post links back to this post. Don't forget to leave me an email with your comment if you don't have a blog. I will email the winner. This giveaway ends on December the 15th. Oh Cathie! I am sorry your internet service is out....hope it is back on soon. Your cupcake paintings are so cute. 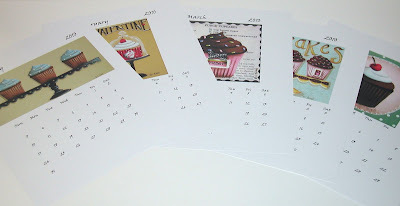 I love everyone, so I know that the cupcake calendar will be fabulous! BIG SMILES....... I am the first to leave a comment! Yeah...maybe that will bring me luck! Oh Dear I know how awful it is to be without the internet especially when your business depends on it! We will send good thoughts that it gets fixed sooner! I am delighted at the chance to win your give away! You are such an inspiring artist! How exciting! I would be thrilled to win! I could use a beautiful calender this year! Thank you! Did you check out any books? I haven't had time to read! Happy Holidays! Oh Catherine, I love them all. Please enter me in your give-away. And keep warm. Well I've had a rough day/week. I needed a cupcake, but I love your so much and they are far healthier for me. Posted about your giveaway. Check it out. Keep warm, we are so cold up hear that it's darn freezing. Oh my, the calender looks delicious. I would love to be the winner. Thanks for the chance to enter my name. I just posted about your giveaway on my blog, eatwritecreate. The post is HERE. Love your art! I love all your cupcake- versions. And please count me in for your generous and great giveaway. Hi Cathie! I would love to enter your giveaway!! I love your work! I also have posted this on my blog. I love love your cupcakes!! Ummmm.... I sure hope I am getting a calendar for christmas. I love these MOM... I am seriously so excited. How fun!! Love you!! Sorry about the internet how frustrating!! Although still it lacks some days, Merry Christmas! I love your cupcakes and those of Christmas are very cute and pretty. The calendar is great because with each month I can enjoy one of your beautiful cupcakes. Thank you so much for your marvelous creations. That calendar would look great hung up in my kitchen! I'm linking in my current post right now! Cathie, please count me in! I love your work. 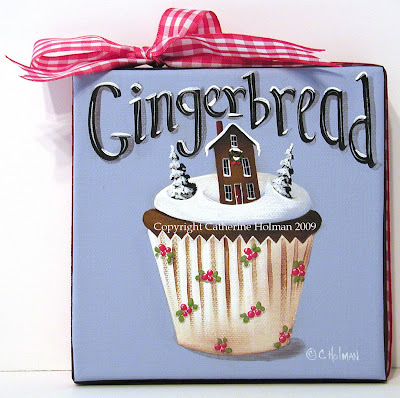 Your beautiful cupcake paintings always make me hungry!! :-) I love them! I hope your internet is back up soon - I know its hard when you work from home - you need daily access. And you calendar and print giveaway sounds wonderful!!! Please enter me! Thank you! Love all the cupcakes, Cathie! Sorry to hear you're having internet problems. The cupcake calender sounds fabulous!